In the beginning, it was hot. Really, really hot. You know how hot the inside of your oven is? Well, that is a relative walk in the park compared to how unfathomably hot it was at the Big Bang. It was so hot that Time, Space, Matter and Energy were indistinguishable. Yea. Hot. A second after the Big Bang things had cooled enough for quarks to form and combine to create protons and neutrons. After about three minutes some of the protons bonded to neutrons. Though it had cooled significantly, it was still pretty hot, about a billion degrees, which was considerably too hot for atoms to form. It stayed like this for about three or four hundred thousand years. During that time, not much happened, but the Universe continued to expand and cool down and after a while hydrogen and helium atoms formed. For another 300 million years there was just a sea of atoms. And Darkness. As the Universe cooled, great clouds of gas started to condense under their own gravity and the first stars were created. These first stars were very different from our Sun- they were larger, hotter and shorter lived. They created energy in the same way our Sun does, in nuclear reactions where lighter nuclei fuse together to form heavier ones. This process continues in a star until its core is composed of Iron. At this point, no more energy can be released. Stars cannot use Iron as fuel. When the star runs out of fuel, the outward pressure created by nuclear fusion is no longer strong enough to act against gravity and within seconds the star collapses in a Supernova explosion. The energies created are so great that elements heavier than Iron can be created. 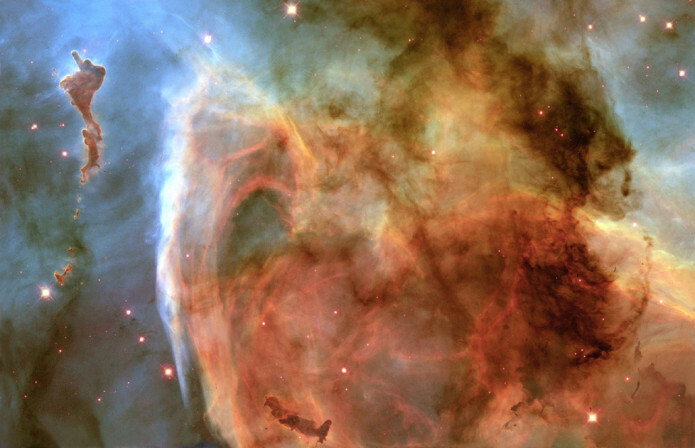 In a supernova explosion, the outer parts of the star are blown out into space at 20,000km per second. For a brief moment a supernova shines as brightly as the galaxy in which it happens. Eventually, all of the material created in the supernova is dispersed and will once again start to condense under its own gravity and create new stars. These, too, will eventually use up their fuel and die in a Supernova explosion. And so it goes on. Elements lighter than Iron were created in Stars. The Iron in your car? Created in the heart of a star. The Iron in spinach? Created in the heart of a star. The Iron in the centre of a hemoglobin molecule in your blood? Created in the heart of a star. Your blood is red because the Universe was created. 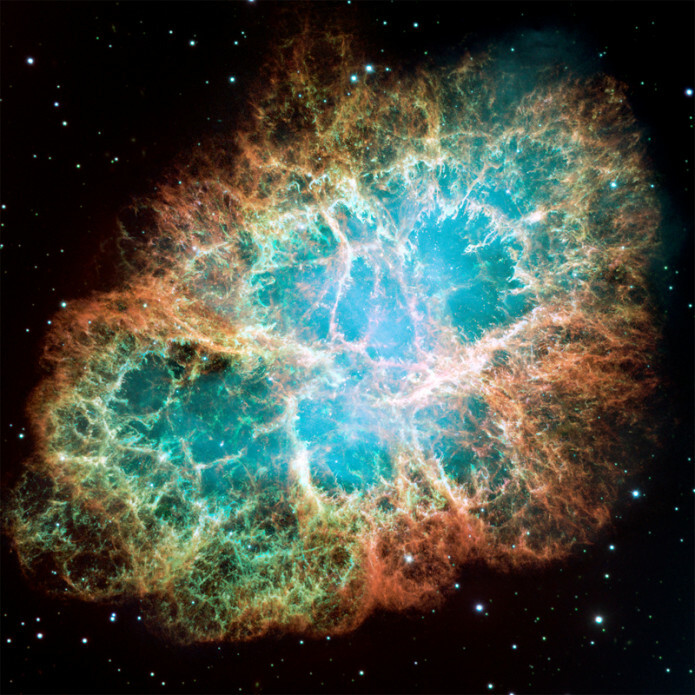 Elements heavier than Iron were created in Supernova explosions. The mercury in your fillings? Created in a supernova explosion. The copper and nickel in your coins? Created in a supernova explosion. The gold or platinum in your wedding band? Created in a supernova explosion. The symbol of your Love for your partner exists because the Universe was created. Who says Science is boring? Today, Dr. Brian Cox came in to talk to the actors about the Universe. He started out with the Carl Sagan-esque question ‘What are we made of?’, went on to speak about the elements and explained how Iron, atomic number 26, is the heaviest element which can be made in the heart of stars. Everything in you- the oxygen, the carbon, the iron which makes your blood red- was made in the heart of a star. Several supernova explosions have been seen over the years. One of the earliest on record is the Crab Nebula. The ancient Chinese, Japanese and the Anasazi (the Ancient Puebloans) of America left records documenting their sighting of the star that died in a supernova explosion and created the Crab Nebula. 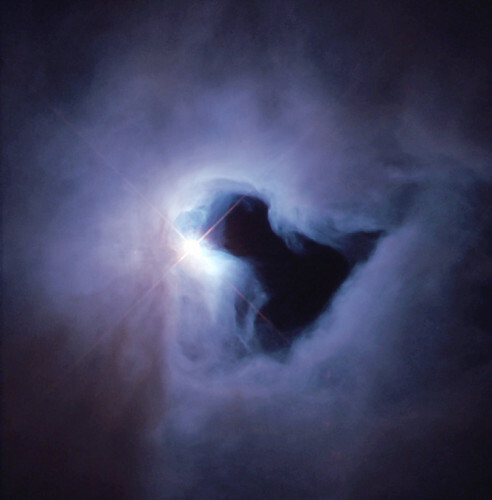 Though it was 6000 light years away from Earth, when it exploded it shone in our sky as brightly as the crescent Moon. Betelgeuse in the constellation Orion is about to die. It is a red supergiant which many astronomers believe will go supernova within the next 1,000 years. It could go tomorrow. Though Betelgeuse is only 15 times more massive than our Sun, it is as much as 40 million times greater in volume; that means if our Sun was a soccer ball, Betelgeuse would be Wembley Stadium in London. Betelgeuse is only 500 light years away from Earth. As a supernova shines as brightly as all the stars in the galaxy for several months after it explodes, when Betelgeuse goes, we will have two suns for a few months. I think the actors’ minds were blown… let’s just hope there’s enough left for them to remember their lines.